This tutorial was written by Jenny on 5/11/2011. Resemblance to any other tutorial is purely coincidental and unintentional. 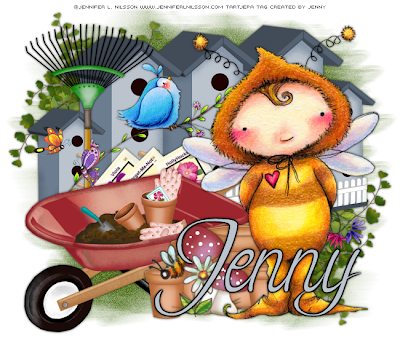 I am using the artwork of Jennifer L. Nilsson. You need a license to use her artwork. I have a license through MyTagArt. New Raster Layer, flood fill with color of choice, apply mask, add noise of choice. Copy & Paste BirdVillageHomes as a new layer, resize 85%, use your eraser to remove the rainbow coffi copyright, place upwards (see my tag), add drop shadow. Open MaidenHairFern, use your selection tool to selection the larger portion on the right, copy & paste as a new layer on your canvas, place upward, behind the BirdVillageHomes, resize if needed, add drop shadow, duplicate, mirror, flip. If you're using the same tubes as me then you'll need to copy & paste the bird tube as a new layer, resize and place on top of the BirdVillageHomes, add drop shadow. Open GardenSeedsSet and select your choice of seeds with your selection tool, copy & paste onto your canvas, see my tag for placement, resize to your liking. Copy & Paste GardenRake as a new layer, flip, resize if needed, add drop shadow, place next to the BirdVillageHomes. Copy & Paste GardenWheelBarrow as a new layer, resize to your liking, place downward and to the left, add drop shadow. Add GardenPotsofClay around the GardenWheelBarrow, resize to your liking. Add GardenKnomesMushrooms mixing them in with the pots, resize to your liking. Copy & Paste your main tube as a new layer, resize if needed, place opposite the wheel barrow, add drop shadow. I added several extras from other tubes of Jennifer L. Nilsson's from MyTagArt such as butterflies, flowers, ect and placed them throughout the canvas. Add text and you're ready to save. I hope you enjoyed this tut. Please leave some love!